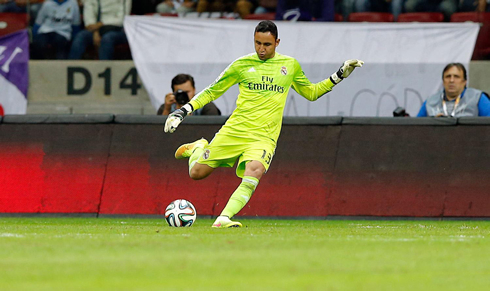 Real Madrid and Fiorentina met each other in a friendly in Poland this Saturday night, with the Italian side coming on top after beating the Merengues by 2-1. Cristiano Ronaldo scored the first goal of the game, but the "Viola" managed to turn things around in their favor, thanks to goals delivered by Mário Gomez and Marcos Alonso. Real Madrid couldn't get past Fiorentina last night in Warsaw (Poland), in a game where the Italians came back from a 1 goal deficit to beat the new European champions by 2-1. The Merengues failed to avoid their 4th consecutive loss in pre-season games and not even an opener from Cristiano Ronaldo was enough to prevent another defeat. Real Madrid can now start preparing for the first leg of the Spanish Super Cup against Atletico Madrid, as the two teams have their first collision scheduled for August 19, in the Santiago Bernabéu. 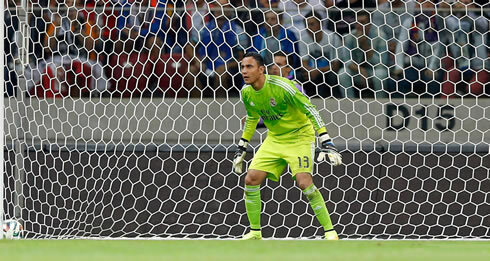 Carlo Ancelotti rotated most of his players for this Saturday's friendly against Fiorentina, starting with the goalkeeper position where Keylor Navas made his debut for the club. Arbeloa and Marcelo took the wings at the back, while Nacho and Varane paired up in the center. In midfield, Ancelotti selected a very defensive block, with Xabi Alonso, Illarramendi and Sami Khedira. The attacking tasks were handed to Cristiano Ronaldo, Angel Di María and James Rodríguez. The first goal arrived quite early in the game and it was delivered by the usual suspect when it comes to scoring, Cristiano Ronaldo. We were still inside the 4th minute of the first half, when Cristiano Ronaldo and Di María powered one of those lightening counter-attacks that we're so used to see from the Merengues and which would be finished by the Portuguese forward. The former Manchester United player started his run way behind the midfield line and netted his first goal in this game after picking a return pass from Angel Di María when he was already well inside Fiorentina's box. The Italians equalized the game in the first half though and still before we had reached the 30th minute. The goal was originated on a compromising mistake by Xabi Alonso, with the former Liverpool midfielder delivering a bad pass to his teammates at the back and allowing the men in purple to set things back at square one. The goalscorer was Bayern Munich's former striker Mario Gomez, who finished off a cross from the right with a flawless header, giving virtually no chance for the debutant Keylor Navas to do anything about it. The "remontada" was only completed later in the second half and similarly to what had already happened in Mario Gomez' header, the Merengues ended up committing a couple mistakes that costed them another goal. Sami Khedira and Alvaro Arbeloa were both poorly beaten by Marcos Alonso near the right edge of Real Madrid's box and the Spaniard was given more than enough space to strike the ball past Navas with ease, beating the Costa Rica international for the second time on the night and giving Fiorentina the lead. With Fiorentina holding on to the 1-goal advantage and Cristiano Ronaldo substituted at half-time, the game lost most of its interest as the two teams slowed down the pace. The Merengues may have failed to impress in another pre-season friendly this summer, but the truth is that there isn't much time left to get ready for the next match. This Tuesday night, Real Madrid is already taking Atletico Madrid at the Santiago Bernabéu, for the first leg of the Spanish Super Cup. Ancelotti is expected to lineup with a formation very similar to the one he used against Sevilla last week and if nothing strange happens in the next few days, Cristiano Ronaldo will most likely feature in the starting eleven, alongside with his partners in crime, Gareh Bale and Karim Benzema. Attackers: Angel Di María, Cristiano Ronaldo, James Rodríguez. Cristiano Ronaldo next game for Real Madrid will be against Atletico Madrid, in first leg of the Spanish Super Cup, on August 19. You can watch Juventus live stream, Real Madrid vs Atletico Madrid, FC Barcelona vs León, Newcastle vs Manchester City, and Liverpool vs Southampton, all matches provided from our live streaming pages.